Born and grew up in Calgary, Alberta Canada. Early musical influences included my mother, who played violin, and my aunt, who studied cello at Julliard with Leonard Rose. First musical instrument was the baritone ukulele. Oh, there was a drum in the house as well. Sang in a church choir for eight years under directors John Marsden and Terry Fullerton. Was the nerdy kid who lurked backstage in junior high and high school, playing the records for the dances and running the lights. Started collecting records, and became interested in playing the drums and percussion. Began drum lessons at the Calgary Conservatory with Gus Pfiffig. Enrolled in Music at the University of Calgary where my teachers included Ross Campbell and Tim Rawlings. While at University, I continued my interest in audio technology by hosting a show on the Campus Radio station, CJSW. Also studied and composed electronic music. Graduated with a Bachelor's Degree in Music Performance (Percussion). 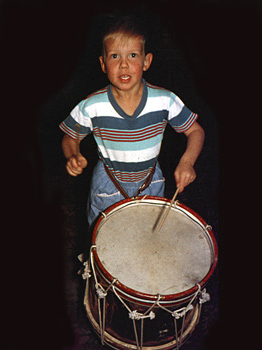 Pursued a career as a performing musician, playing drums with various bands in Calgary. Played timpani for the Calgary Community Orchestra. 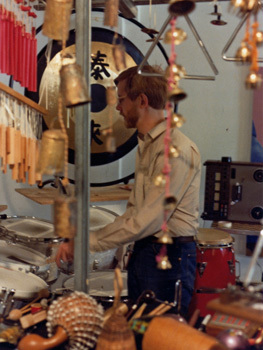 Staged recitals of solo percussion, often including electronics. Studied Tabla and the music of North India for three years at the Allauddin Khan School of Music with Pranesh Khan and Aashish Khan Debsharma. Studied timpani with Tom Miller. Studied vibraphone with Arnold Faber. Supplemented my income by working in Record and CD stores, where my knowledge of Jazz and Classical music was valued by employers such as Sam the Record Man. Became involved in a weekly television - The Chrome-A-Key Kids - show reviewing current Jazz and Classical releases with my good friend, Mike Bezzeg. Mike became interested in managing a local band, and asked me to produce their first record. My introduction to the studio was to have lasting consequences. Studied Studio Recording through the course offered by local studio Sundae Sound. Became one of the staff engineers at Sundae. Engineered local rock bands, country bands, classical musicians, narration projects and advertising. Ran live sound for local cowboy music legend, Ian Tyson. Moved to Montreal to study at McGill University. Instructors include Wieslaw Woszczyk and Peter Cook. Studying at McGill transformed my whole approach to music recording - I became more interested in the specialized requirements and techniques of recording Classical Music and Jazz. Recorded soloists, chamber music, large choral groups and instrumental ensembles. Graduated with a Master's Degree in Music (Sound Recording), also known as the Tonmeister degree. Accepted into the Post-Graduate Audio Residency at the Banff Centre. 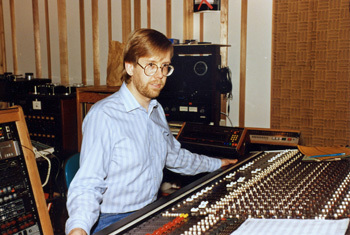 The emphasis was on assisting composers to incorporate studio techniques and technology into their compositional process. 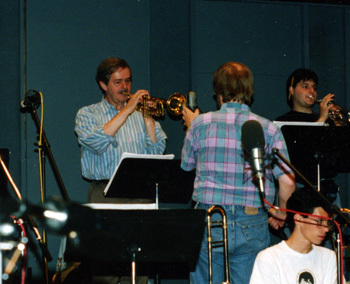 Engineered many unconventional recordings of classical and jazz performers (that's Kenny Wheeler in the picture to the left) in sessions and in concert. Recorded Anton Kuerti, Connie, Anne and Patricia Shih, Robert Aitken and Jean-Pierre Drouet, Fides Krucker and Beverley Johnston, composers Wende Bartley, David Eagle and Will Moylan, as well as producing CD recordings for Vivienne Spiteri (avant-garde Harpsichord), Kirk Elliott and the Penderecki String Quartet. Hired by C.B.C. Saskatchewan as Senior Music Recording Engineer. Recorded the Regina and Saskatoon Orchestras as well as the Hilliard Ensemble and the Shostakovich String Quartet for National Broadcast. A personal highlight was the opportunity to record Joni Mitchell premiering the song "Magdalene Laundries" from her Grammy winning album, "Turbulent Indigo". Moved to Toronto at the end of my C.B.C. contract and started Lockwood ARS. This process was greatly assisted by the Self Employment Assistance Program, where I learned the basic skills of running my own business. Started what was to become a long association with Stephanie Martin, with a Christmas CD for the Calvin Presbyterian Church Choir. 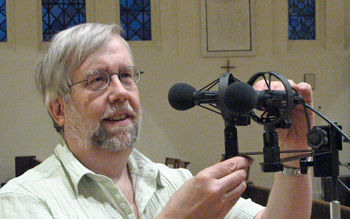 Recorded many concerts for various organizations such as the Amici Ensemble, Mooredale Concerts, Aldeburgh Connection, the Victoria Scholars, Ensemble Unterwegs (Brainerd Blyden-Taylor) and the Toronto Children's Chorus through my affiliation with Ed Marshall. Family commitments took me back to Calgary, where I managed the care for my parents in the final stages of their lives. Recorded and edited Amanda Forsyth's Soaring with Agamemnon featuring solo works for cello by her father, Malcolm Forsyth, as well as works by Gavin Bryers and Arvo Pärt. Began working with pianist Allen Reiser, recording and editing two discs, A Canadian Piano Album and Sonatinas and Little Sonatas. Other artists recorded include child prodigy Wesley Chu, soprano Lyudmila Pildysh and baritone Paul Grindlay. Became an honorary Ukrainian, recording several discs for the Korinnya Folk Ensemble (pictured left), and through them, the Divine Liturgy of St. John Chrysostom at St. Vladimir's Ukrainian Orthodox Church. 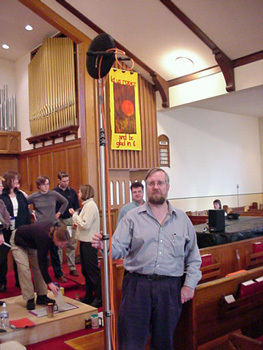 A portion of this recording was used for the film "Toronto's Houses of Worship". Engineered the recordings of the musical performances seen on-screen in the movie, "The Claim", directed by Michael Winterbottom. Acquired the position of Recording Engineer and Instructor of Audio Technology at Ball State University, Indiana. Construction of the Music Instruction Building had just been completed, a multi-million dollar facility housing Sursa Hall - a technologically and acoustically advanced performance venue. 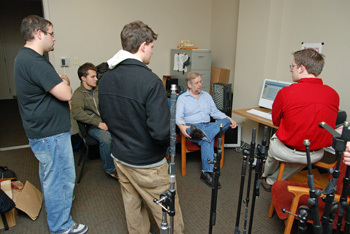 Taught classes in music recording technology and supervised the students employed by the School to record concerts and recitals held in the School's three performance venues. 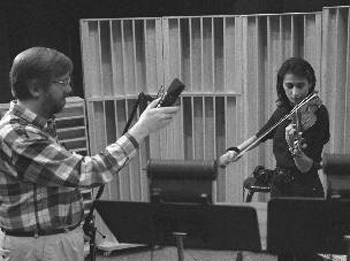 Recorded and edited CDs for faculty members Robert Palmer, Elizabeth Richter and Mihai Tetel. 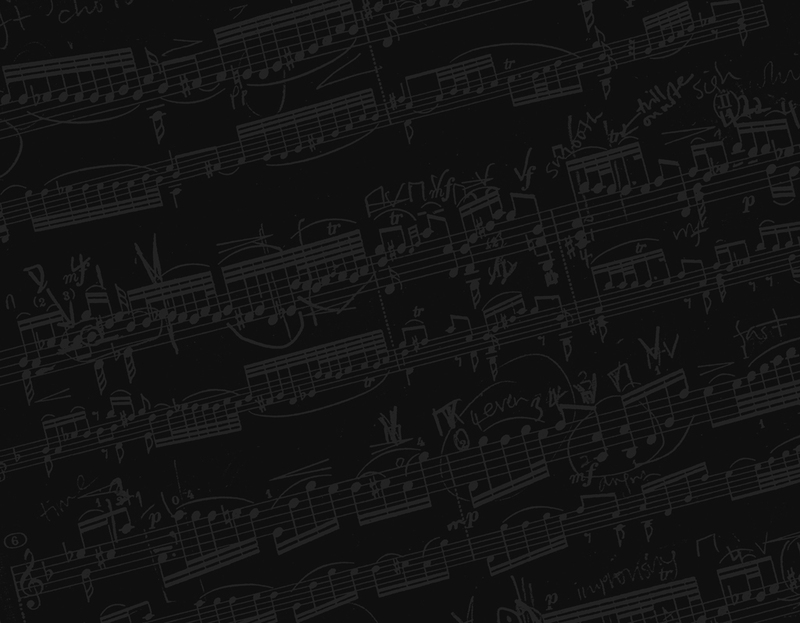 Engineered recordings of operas, orchestral concerts (with and without chorus), and many, many chamber and solo recitals. Touring guest artists recorded include the Burning River Brass Ensemble and pianist Irina Voro. Returned to Canada and the music mecca that is Toronto, to re-establish my recording business, Lockwood ARS. Provided orchestral miking expertise to the CTV recording sessions for the "Hockey Night in Canada" theme. Produced a music performance shown onscreen in the TV show, Hannibal. Provided noise reduction and audio restoration services for Associated Buzz Creations (Alan Hardiman), composer Blago Simeonov and film composer Phil Strong. Volunteering with the Toronto Section of the Audio Engineering Society, and is a Past Section Chairman.